Mixwit makes it easy to create embeddable mixtapes (otherwise known as custom playlists). We touched upon the company a couple weeks ago as part of our Y Combinator demo day roundup but never gave it our full treatment. A similarly-named service called Mixaloo serves up label-sanctioned tracks and requires users to buy them to hear more than 30-second previews. Mixwit differs by drawing its songs from Seeqpod, an MP3 search engine that indexes full-length tracks from mainstream artists but charges nothing for them. Granted, not all of the audio files found by Seeqpod have decent quality (many simply don’t work at all) but that’s the price of free. Both companies facilitate the spread of mixtapes across the net, but the costlessness of Mixwit really gives it an edge (despite Mixaloo’s promise to split sales revenues with mix creators). Mixwit also provides more extensive tools for customizing the look and feel of the mixtapes themselves, lending itself to greater ranges of self-expression. 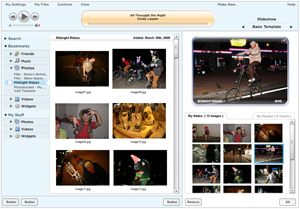 Users can pick from a collection of nice-looking skins, upload their own images, and tweak several other settings such as shadow and gloss effects. So the creation and sharing of mixtapes with Mixwit is easy and effective. But what I find particularly interesting are Mixwit’s plans to expand its offering into a more complete online media solution. The founders like to describe their company as a cross between Slide and iTunes because they plan to release an in-browser media player that will leverage the APIs of various web services to collect content found across the web. In addition to Seeqpod, they plan to include support for Flickr, YouTube, and Skreemr as well. The idea is that you’ll be able mash up different types of media (music, photos, videos, etc), bookmark them, compile them into playlists, and share with friends via widgets and the player itself. This product has yet to make it off the drawing board (the second screenshot above is just a mockup). But the idea is promising and could be a big hit with social network junkies. 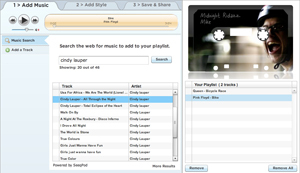 It would also be a browser-based cousin of Songbird, a Mozilla-based desktop app that also strives to be the web’s media player. Update: We’ve removed the widget once embedded here for fear of driving up someone’s hosting bill. Go here to see it.